Vehicle maintenance costs make up a large percentage of any fleet’s budget. Efficient processing, accurate tracking and reporting of maintenance transactions is more important than ever to help fleet managers control maintenance spend and reduce vehicle downtime. We are pleased to announce that we have updated our Maintenance program to provide our customers new features and benefits geared towards lowering their fleet’s maintenance expenses. Donlen has a highly experienced team of maintenance advisors, most of whom hold multiple ASE certifications. Our maintenance call center operates at best-in-class levels around key metrics such as hold times and customer service quality. The purchase order system is the platform our maintenance advisors use on a daily basis to manage maintenance transactions on behalf of our customers. We have now launched an all new purchase order system with technological enhancements that match the quality of our advisor group for the benefit of our customers. 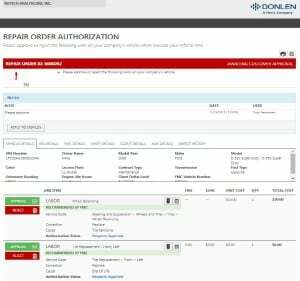 The new purchase order system is electronically integrated with major maintenance vendors in the fleet industry. Donlen is essentially connected with vendors’ point-of-sales systems, and we return this information in a consistent format back to our customers. The electronic integration enhances accuracy of information and enables Donlen to process transactions more efficiently. When Donlen receives an electronic maintenance request from a vendor, we review and approve every one of them. We have established careful algorithms in our new purchase order system that enable us to provide instant approval from the system without the need for advisor review. This is useful for straightforward transactions, such as preventative maintenance services for oil changes and tire rotations. That in turn creates new capacity within our advisor team to review the more complex transactions with an added level of scrutiny. “Not every maintenance transaction is equal”, said Oliver Zerhusen, Director of Maintenance and Accident at Donlen. “Our goal at Donlen is to continuously optimize the allocation of advisor time to create maximum benefits for our customers.” Through this approach, we further improve the quality of our maintenance offering, in particular with even higher consultation savings that our advisors identify and realize. We have also enhanced the maintenance service codes in our new purchase order system, quadrupling the catalogue to now about 4,500 service codes in total. This provides our customers the ability to dissect maintenance data in more meaningful ways. These views can reveal insights such as differences in driver behavior or maintenance vendor performance, and subsequently trigger a positive change process within a fleet. These new updates to our Maintenance program feature the same integration with FleetWeb that Donlen customers have come to expect. With full FleetWeb integration, we’ve given our customers the power to access more accurate real-time maintenance data at any time, from anywhere. Want to learn more about these exciting updates to our Maintenance program?